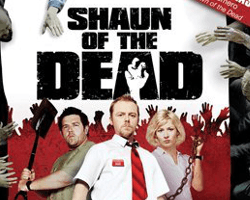 Halloween bash or zombie soiree then look no further. 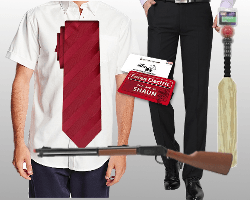 We will take you through a step by step guide on how you can put together an outfit for Shaun that includes his trademark red tie that doubles as a bandana later in the film and his Sales Advisor Badge showing his place of work, at Foree Electric. 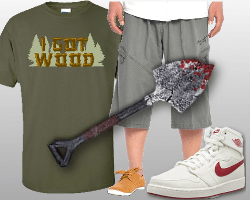 Equally, we have Ed’s I Got Wood shirt that makes him immediately recognisable, just add a shovel or a can of beer for the full effect! For those who need an introduction from our zero to hero, Shaun Riley, we have a review of the movie complete with synopsis, character descriptions and a comprehensive guide to the multitude of prestigious accolades this iconic film has been awarded. 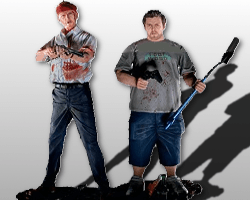 The action figures found in our Shaun of the Dead Merchandise are extremely detailed, quality figures that would be highly sought after by any Shaun of the Dead fan. 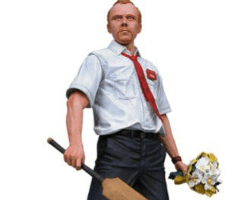 Who is not going to love a delightful action figure of Shaun spouting his instantly recognisable catch phrases from the movie? 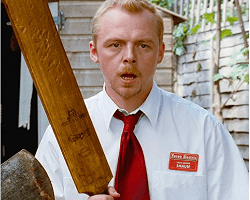 We also give you the chance to get your hands on an authentically autographed cricket bat, signed by Simon Pegg and accompanied by the relevant authentication documentation. 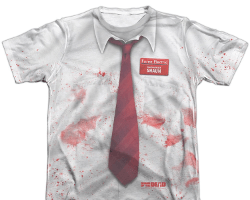 If that has whetted your appetite, check out our tshirts and other Shaun of the Dead Merchandise to which we will be adding regularly. Now, how’s that for a slice of fried gold?